Within each stage of growth there are four directions we must reach toward in order to grow: in, out, up and down. The following material is designed to help you reach down through evangelism. This survey is designed to measure your growth into an effective evangelistic leader. In II Peter 1:5-8, the Apostle Peter lists for you the necessary ingredients to "keep you from being either barren or unfruitful in the knowledge of our Lord Jesus Christ." (vs. 8) No one who has ever met Jesus has ever gone away without being changed. The knowledge of Jesus will force you into action. You will either run to Him or from Him, but you will run. As a Christian leader, it is now your responsibility to so develop the qualities mentioned in this passage that, when others see you, they will also see Christ. In so doing, you will become an effective soul winner. As each description is discussed, rank your achievement level on a chart that measures from 1 to 10. 1. "... add to your faith" - Without faith it is impossible to please God. (Hebrews 11:6) In the Greek language, the word for faith is pistis. It means firm persuasion, a conviction based upon hearing. (Romans 10:17) How would you measure your depth of conviction and persuasion? Do you trust God enough to wholly surrender your financial security or the well-being of your family? How would you measure the level of mastery you have achieved in this area? 2. "... add to your faith virtue" - In the Greek language, the word for virtue is arete. It means moral goodness, the soul vigor to do what is right. How firm are your convictions? Does your virtue empower you to always stand for what is right, even when it is inconvenient or awkward to do so? How would you measure the level of mastery you have achieved in this area? 3. "... add to your virtue knowledge" - In the Greek language, the word for knowledge is gnosis. It means absolute knowledge of spiritual truth. Some things are known by the testimony of others and other things are known by personal experience. What is your level of personal knowledge of the Scriptures? How would you measure the level of mastery you have achieved in this area? 4. "... add to your ... knowledge self-control" - In the Greek language, the word for self-control is enkrateia. Its meaning comes from the root word kratos meaning strength. To what degree are you in control of your emotions, thoughts and impulses? How would you measure the level of mastery you have achieved in this area? 5. "... add to your ... self-control perseverance" - In the Greek language, the word for perseverance is hupomone. Although this word is often translated patience, its meaning is far better conveyed by the word endurance. How spiritually tough are you? What degree of persecution could you endure? How would you measure the level of mastery you have achieved in this area? 6. "... add to your ... perseverance godliness" - In the Greek language, the word for godliness is eusebeia. It denotes piety which is characterized by a Godward attitude. How much of God is seen in your daily walk? How would you measure the level of mastery you have achieved in this area? 7. "...add to your ... godliness brotherly kindness" - In the Greek language, the word for brotherly kindness is philadelphia.Galatians 6:10 tells us: "Therefore, as we have opportunity, let us do good to all, especially to those who are of the household of faith." To what degree do you prefer your spiritual family? To what degree do they receive your benefit of the doubt? How would you measure the level of mastery you have achieved in this area? 8. "... add to your ... brotherly kindness love." - In the Greek language, the word for love is agape. The type of care and affection being described here goes beyond the spiritual family and includes all men, even "those who hate you ...spitefully use you and persecute you." (Matthew 5:44) How would you measure the level of mastery you have achieved in this area? 3. Reassess - Change often comes incrementally. Taking regular assessments of your progress, and then making adjustments accordingly, is vital to success. After every assessment, repeat the steps above and adjust the parts of step 2 as needed. Develop a schedule of times that you will take regular assessment of your progress. Next time we will look at a biblical survey that can help you grow as a leader by growing into the nature of God. Until then, keep the faith! Back to Top of "Keep the Faith! 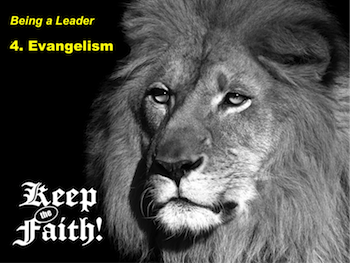 Being a Leader 4: Evangelism"